Lewis Hamilton and Mercedes were the team to beat during Friday's practice for the Austrian Grand Prix. 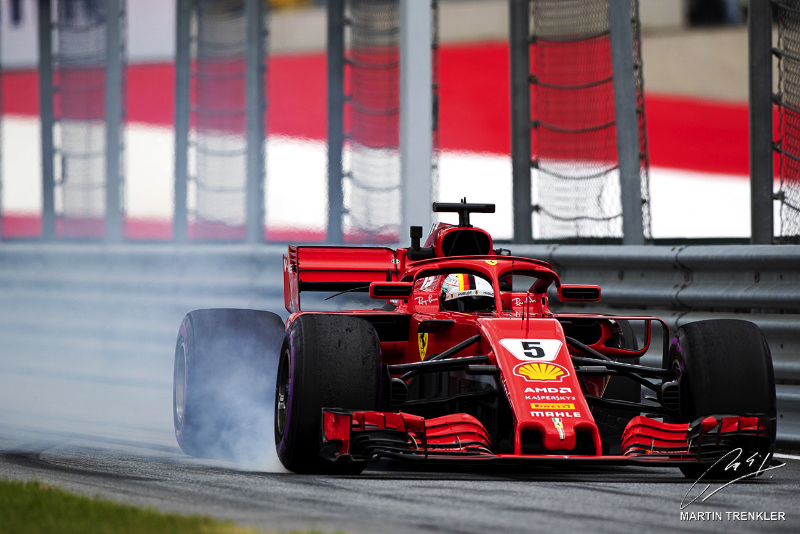 But things switched in Saturday's practice session as Sebastian Vettel and Ferrari went fastest, albeit a mere 0.0029 of a second quicker than Hamilton. The line-up for the weekend was: Mercedes - Hamilton and Valtteri Bottas; Ferrari - Vettel and Kimi Raikkonen; Red Bull TAG Heuer - Daniel Ricciardo and Max Verstappen; Force India Mercedes - Sergio Perez and Esteban Ocon; Williams Mercedes -Lance Stroll and Sergey Sirotkin; McLaren Renault - Fernando Alonso and Stoffel Vandoorne; Renault - Nico Hulkenberg and Carlos Sainz; Toro Rosso Honda - Brendon Hartley and Pierre Gasly; Haas Ferrari - Romain Grosjean and Kevin Magnussen; Sauber Ferrari - Marcus Ericsson and Charles Leclerc. Hamilton topped both Friday sessions in the latest Mercedes. "It's really great to see the updates," he said after FP2. "The guys at the factory have been working so hard to bring quality components. The car feels better in certain areas around the track which is already a step forward from last week. The car felt immediately better coming out of the garage. I'm going to keep pushing, trying to maximize a bit more out of it." Pirelli's tire compounds for the weekend were the soft, super soft and ultra soft. Alonso and Ericsson were the first out in FP3. The ambient temperature at the start of the 60-minute session was 70 degrees Fahrenheit (21 degrees Centigrade) and the track temperature was 95 degrees Fahrenheit (35 degrees Centigrade). Only seven cars came out in the first seven minutes, and only car #7 - Raikkonen - set a lap time: 1:05.839. He lowered that to 1:05.314 and then, on his seventh lap, a 1:04.937. He was on the ultra softs. "No rush to start the session," Renault tweeted. Finally, 15 minutes into FP3, the track started to get busier. Most of the drivers were running the ultras including Vettel who posted a 1:04.920, which was 0.017 faster than car #7. Bottas and Hamilton slotted into third and fourth. Eighteen minutes into the session Hamilton took the lead with a time of 1:04.672. Bottas beat that with a 1:04.594. Vettel went 0.006 of a second slower on his next fast lap. At the midpoint of FP3 the order was: Bottas, Vettel, Hamilton, Raikkonen, Ricciardo, Verstappen, Grosjean, Sainz, Alonso and Hulkenberg. A few minutes later, Raikkonen was on a flier before sliding off at, appropriately, Turn 7. But then he had another go and climbed to the top with a time of 1:04.470. With 20 minutes to go, Vettel posted a 1:04.159. Bottas grabbed second with a 1:04.204. Vettel improved to 1:04.070. With 15 minutes to go, the order was now: Vettel, Bottas, Raikkonen, Hamilton, Verstappen, Ricciardo, Grosjean and Alonso. Then Hamilton turned a 1:04.099, putting him second and 0.029 of a second slower than Vettel. Verstappen stopped on the track with eight minutes to go. "The engine just suddenly turned off," he radioed. The top 10 at the end of FP3 were: Vettel, Hamilton, Bottas, Raikkonen, Verstappen, Ricciardo, Grosjean, Magnussen, Sainz and Leclerc. But the session did not end well for Leclerc who stopped at Turn 2 with a suspected engine problem.